We’ve talked a little bit about the strong hub design - a semi-centrally located hub where you put the Builder Hall (BH) and key defenses. At BH8, this design still works very well and adds a new component - the Mega Tesla. The Mega Tesla is a slow firing, heavy damage point defense that hits two targets within close proximity of each other. 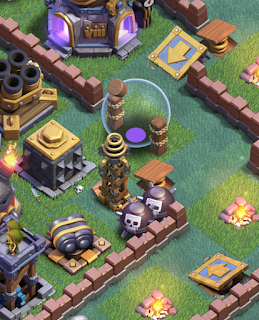 It actually targets the first troop but there’s so much juice in its beam that it just naturally covers the gap to the next nearest target and zaps that one too. (Of course, there’s a limit to how far the second spark will go.) We also get a third Hidden Tesla. Between the two existing Hidden Teslas, this third one, and the Mega Tesla…well, let’s just say you can really light up night mode! 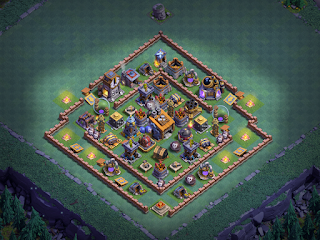 The new strong hub will spread your key defenses out just a little bit more than in previous BH levels so it’s important to build the overlapping defense zones we’ve discussed in the past. From the perspective of ground attacks, you want forward and rear defense zones. The MultiMortar should be deeper in the base and typically part of the rear attack zone, enabling it to drop on inbound troops. 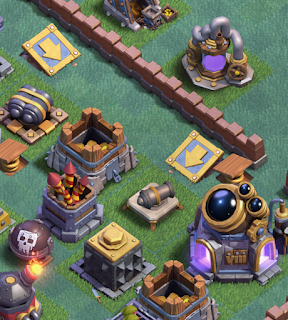 The Giant Cannon and Roaster comprise the forward defense zone and the Mega Tesla takes center stage. You’ll see this in both of these first two designs. The new Mega Tesla and third Hidden Tesla also offer the ability to create a Tesla farm as well. I’ve placed this right in the middle of my base, with the Hidden Teslas forming a triangle around the Mega Tesla. This design turns the strong hub into more of an oval than a circle. We still have the forward and rear defense zones, but the hub is a bit more extended. The third hub design I use is a clustered hub. 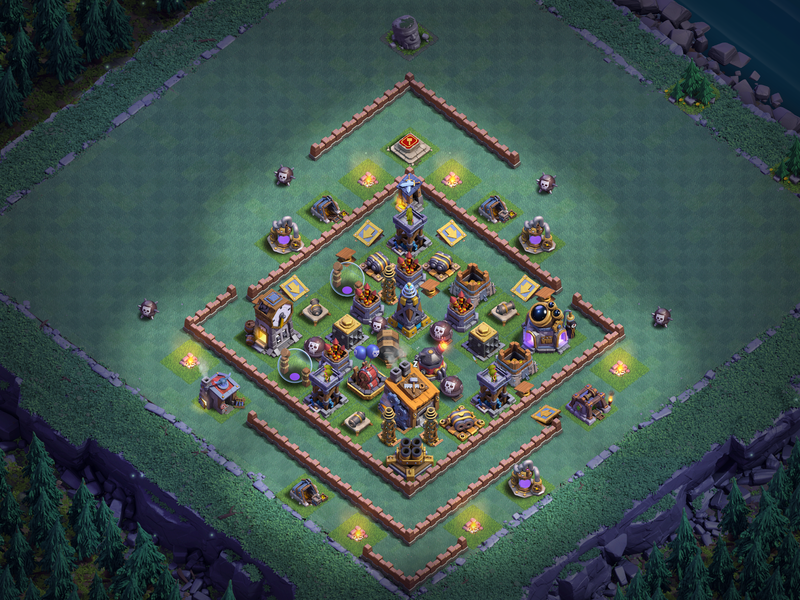 I switch the layout periodically, moving key defenses around the BH as seems to best fit the meta. You might also notice that, in all of these designs, I am using diamond shaped bases and two have open centers. There is method to the madness here. First and foremost, at BH8, true box bases are very easy to take down with Cannon Cart based strategies. 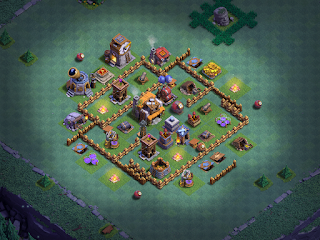 Most box base designs are fairly open and spread out, so they have difficulty defending against these attacks. Those that compartmentalize also suffer against air attacks due to the spread; they may employ overlapping defense zones but the coverage tends to be less. In all cases, it’s very difficult to control troop deployment and pathing with box bases, and that becomes even more important at BH8. For three reasons (and more) I prefer diamond shaped bases at BH6 and above. I find the orientation and spread work much better with my hubs, especially when I run an extended hub like the oval shaped I mention above. The only way for an attacker to be the master of his/her own deployment with these base designs is to devote one camp to Bombers, and that’s a lot of offensive real-estate just to break down the door. Now let’s focus in on the hidden stuff. Defensive regions form circles, of a sort, around the hub. Each layer serves a purpose starting with distractions and pathing disruption at the outer layers, all the way into the center. Some layers are wider than others, some have defenses all around while others have few. Hidden Teslas offer the unexpected point defense slam. You know they could be in any of the 2x2 bare spots you see, but it’s not simple figuring out which. MegaMines, Mines, Push Traps, or Spring Traps may be there as well. 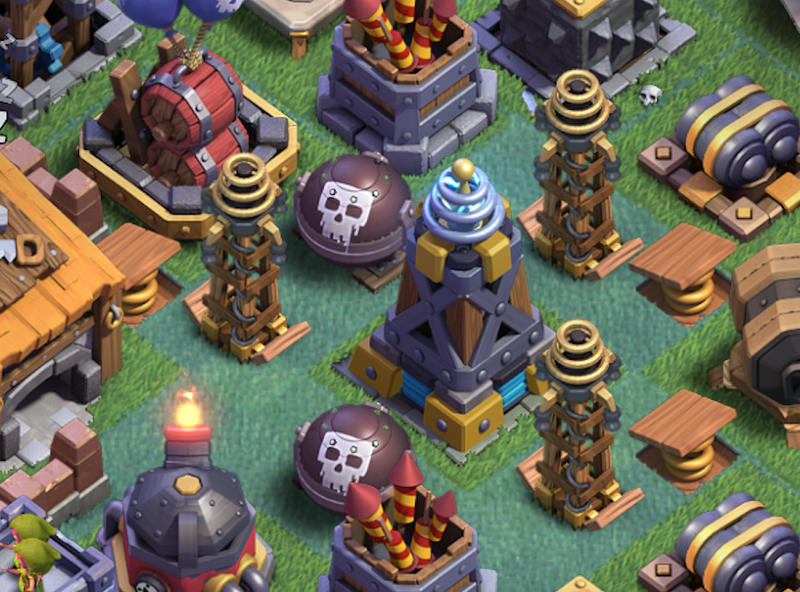 I like to place Hidden Teslas where they will be easily activated by troops attacking another structure. The idea is to use them as a source of great angst for attackers. Sometimes, I’ll even position a push trap to throw enemy troops into their range. Once they’re up, they have an effective range that allows them to overlap as many as two defenses; while enemy troops are busy attacking structures at the edge of the Hidden Tesla’s attack zone, they’re getting zapped. With the addition of the Mega Tesla and a third Hidden Tesla to BH8, I’ve added a Tesla farm to one of my base designs. The Mega Tesla provides the same overlapping coverage to the Hidden Teslas that they provide to other structures and with it’s double-zap power, this can be a real problem for tanking units like Boxer Giants and Drop Ships which need to get right on top of a structure to take it down. Push Traps and Spring Traps are useful for disrupting the flow of an attack, especially if you can position them in such a way as lead troops get past them and secondary troops (which are usually being protected by the lead troops, as in a Cannon Cart attack) trip them instead. I like placing Spring Traps on corners and in wall openings. You’ll see this all over among lower bases, especially box bases with openings at top/bottom or left/right. Positioning two in the same path is useful as well - attackers expect the first one and trip it with a single Raged Barbarian then flood troops in, thinking the path has been cleared, only to have a bunch of troops go flying when they hit your second Spring Trap. I mentioned using the Push Traps to activate Hidden Teslas; I also try to position at least one (if not two) with the Crushers in their landing zone. I’m not a fan of using Push Traps to simply throw a troop back/outside a base but you have to be careful about throwing them inside the base as well - the wrong troop thrown into a base will actually cause MORE damage than if the troop were simply allowed to work its way in through normal pathing. Case in point - the Super PEKKA. The Super PEKKA is too heavy to activate a Spring Trap but Push Traps will throw them all over. When I’m running Mass Super PEKKA, I actively seek out Push Traps because I know they’ll throw her into the middle of the base. This is especially gratifying when she lands in front of a Crusher because she has plenty of HP to survive a couple drops and will usually take the Crusher down. 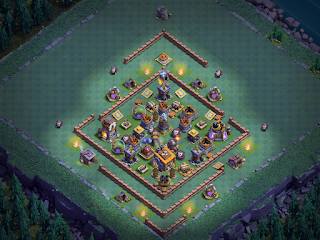 Some players (myself included) will use multiple Push Traps to send troops around the base. My favorite is to put the X from one Push Trap on top of another or even a Spring Trap or Mine/MegaMine. I’ll often do this with Push Traps, launching troops from one to the other then into a Crusher. Two caveats here - first and foremost…be careful about where you place these. Push Traps and Spring Traps are one hit wonders - a single Raged Barbarian is all it takes to trip the trap and then they’re no longer in play. And with Push Traps, be sure you drop the troop(s) where you really want - I’ve sent troops into a Crusher only to realize that I had a MegaMine whose activation zone overlapped with where the troop lands, tripping the MegaMine and rendering it useless in the battle. Speaking of Mines and MegaMines…. Mines are typically used to shave a percentage off the life of a troop, whereas MegaMines will usually take the troop out altogether. Both are splash damage defenses, meaning they affect all troops within their blast zone. Mines are best used either on the way into your defensive layers (to weaken) or close up to the BH to finish off troops that have been heavily weakened by the defenses they just plowed through to reach the BH. MegaMines, on the other hand, are typically used to eliminate troops. Anyone who has ever run NightWitches knows what I mean - putting that MegaMine in the upper right corner was a favorite way of taking out NightWitch spammers. (Of course, that’s why most players now drop a tanking unit before deploying the NightWitch portion of an attack). That said, you usually want the MegaMines somewhere between your hub and the outermost layer of your defensive zones. 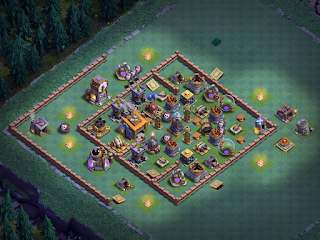 If you place them at the edge of your base, they’ll likely be tripped by just a few troops - often by just one. Placed in the hub itself and you MIGHT take out a bunch of troops but you’re more likely to run up against a stronger troop like Boxer Giants or the Battle Machine who can survive the blast. Scattered about in the middle layers, they have the greatest likelihood of hitting a wider swath of susceptible troops. 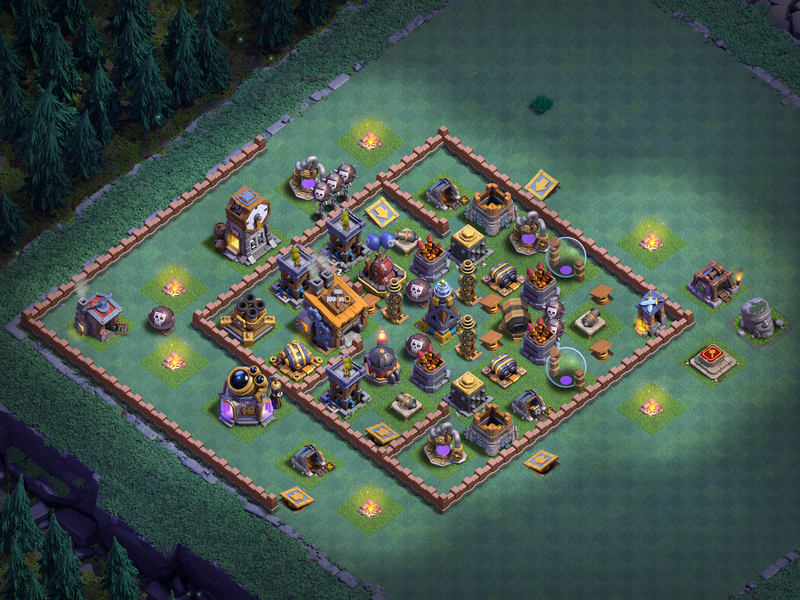 Both Mines and MegaMines are also good for pushing troops around. 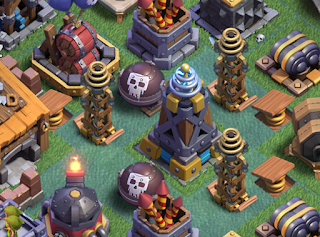 When a troop activates them, it will be pushed back a couple of squares (assuming it isn’t vaporized, of course). You can use this to push them into other defenses like the Crusher. 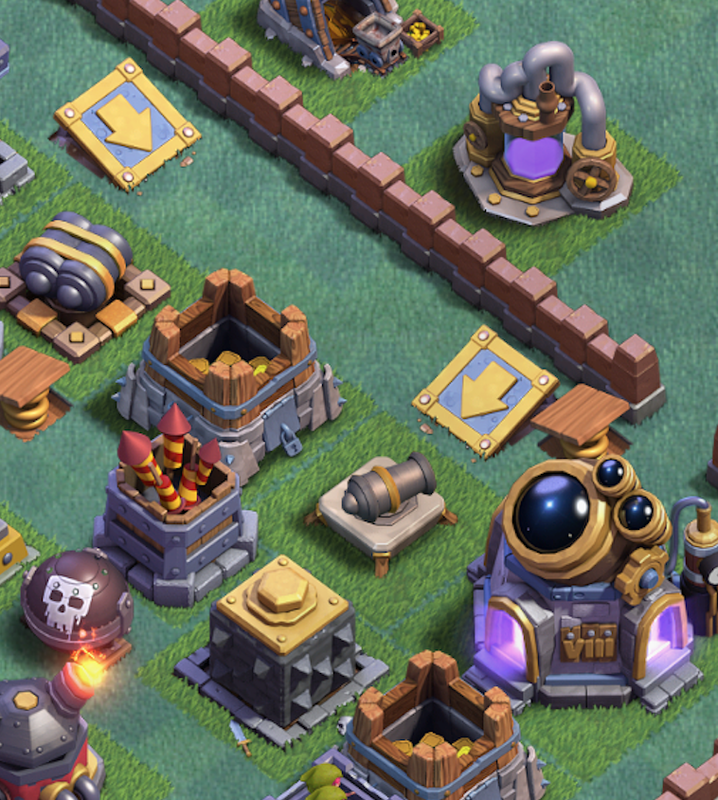 Keep that in mind though…cozying your Mines right up next to a Crusher will also push troops away from the Crusher, outside its impact zone, just before it drops. That can be all that’s needed for a bunch of Raged Barbarians to take it down. The quintessential debate - do I set these to air or ground? THAT depends entirely upon the meta. The meta is in constant flux - it is decided by the tactics actively used wherever you’re at in the game. The meta in the 3K trophy range is NightWitches; at 3500, air takes over; at 4000 it shifts to a either air or ground; from 4500, it’s largely ground. Next week, that may completely turn about and run a different order. 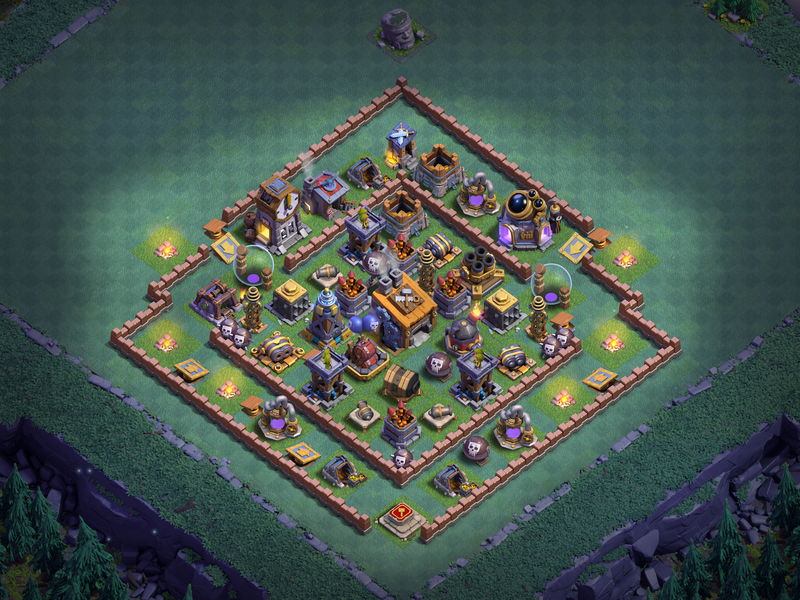 As a player, you need to be able to identify the meta for your particular level and adapt your base accordingly. At the start of BH8, Minion Drops was, hands down, THE meta attack. We’d had the opportunity to utilize extra time at BH7 to get Drop Ships maxed and even those who hadn’t done so were able to use them from L10 and up to great effect. So…when BH8 dropped, that was the attack of choice because it is so strong and very reliable. As such, we all set Mines and MegaMines to air. You still may run into an air mine field when going up against some players. After a couple of weeks, the meta shifted to Cannon Cart attacks and those Mines/MegaMines dropped back to the ground real fast. As defense starts to catch up to offense, there will be a mix of ground and air on both sides. To decide both placement and setting (air/ground), you need to consider the pathing and watch the meta. Nothing deflates a mass attack faster than a well placed MegaMine. (Like I said…just ask any NightWitch attacker.) Consider using MegaMines in areas that are lacking for splash damage as a way of responding to attacks deployed against point and ranged defenses. Here's the link to this article's companion video. A bit more in the way of visuals as I talk about the above 3 bases, how their layouts were made, and how they work.